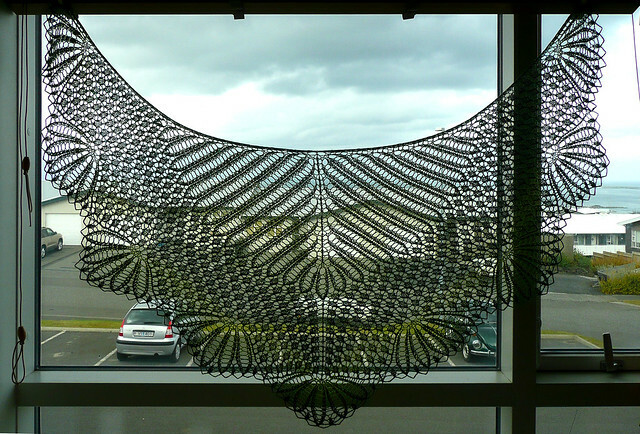 The idea of making this shawl began when I shared some pictures of the last shawl I made (Hagakiri) on Facebook and my friend Þóra posted a comment on it asking how much it would cost to make a shawl like that one. I am REALLY bad at putting a price to the things I make basically because I make them just for the fun of it. I have sold just a few of the things I have made (a couple of Icelandic pullovers and a headband, it is all I remember) to people that are not really that close but selling something to a friend... IMPOSSIBLE (at least for me). In the end we agreed to make an exchange which is much more fun than getting money, isn't it? begins with just 7 stitched. I replied to her comment inviting her to meet in the yarn shop, I would bring some books and she would choose the yarn she liked. So, we met, took a look of a few books, looked up in the internet and some other books that were in the shop until she finally decided that she wanted a Hyrna Herborgar. That was great for me because this is one of my biggest favorites! I actually bought the book Þríhyrnur og langsjöl mainly bacause of this pattern. I really like the transitions it has, starting with the double yarn overs and the spider web sections and ending up with the amazingly beautiful edge, unlike Haruni, that is also very pretty but it has just one big leafs section and pretty edge. It is a lot of fun to knit something that changes so much so you are not doing the same forever. About the yarn. 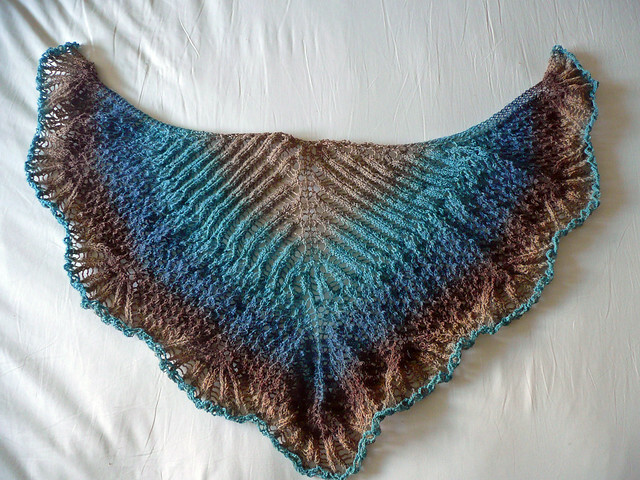 She chose from Evilla Artyarn 8/2, which is also one of my favourite yarns to work with. 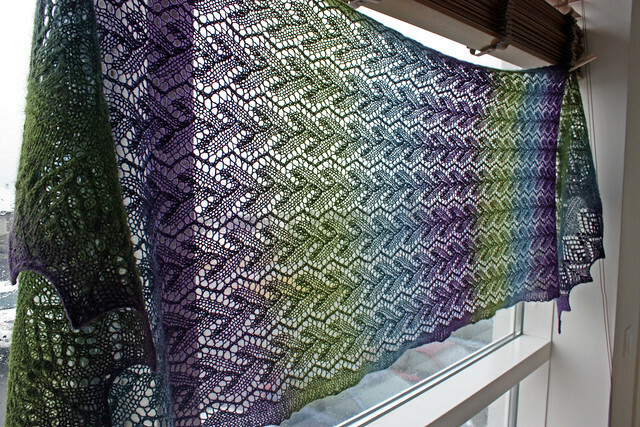 I think that the color combination is wonderful but I must say that I wasn't so convinced about it at first because I thought that the colors were too unusual and my main corcern was that I wasn't sure about how the colors were going to "develop" across the shawl. And I think that Þóra wasn't so sure either but we just went for it! As soon as I got home I winded the yarn and started to knit! At first it went a little slow because at the same time I was knitting this lopapeysa for another friend but still managed to have both projects done pretty quickly. Just finished. Unblocked. It looks so ugly! 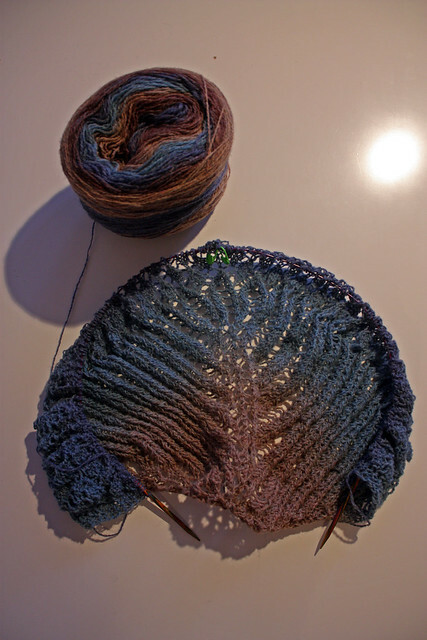 * After having knitted almost all of the first section of the shawl (double yarn overs)99 I realized that I didn't like how the colors were showing up so I frogged everything and started again but this time using the other end of the ball. Now it started to look very nice. Fortunetely this part of the shawl is a very fast knit. * When I was kntting the second section, the spider web, which is very simple because it is the repetition of only two rows, another accident! I was almost done with half of it when my stitch count went off!! I looked at the charts... then looked at the needles... then the chart again... and so on for about 15 minutes without being able to find the mistake! (I forgot to say that it was pretty late already... around 2am maybe?) In the end I had a "FURY ATTACK" and started to frog and frog and frog. In total I went 16 rows back to finally realize that there was no mistake at all... I was just reading the wrong row from the chart!!! After these two little "accidents" everything went smooth again and managed to finish the shawl really quick, even though the rows were getting ETERNAL! Off the needles and ready to let magic happen: BLOCKING. What a wonderful thing! Once blocked I could see that the colors go great together... it looks kind of eatable!! Blocking. I used 4.5mm needles and the result was a lot bigger than the one I made before using 4.0mm needles. 0.5mm make a HUGE difference. 1. Before starting knitting with these multicolored yarns: TAKE A LOOK AT IT AND SEE WHAT IS THE BEST END TO START WITH. 2. Which should be RULE NUMBER ONE: NEVER KNIT LACE WHEN IT IS TOO LATE AND YOU'RE TOO TIRED. Bad things can happen. Te quedó muuy lindo! Voy a agregar este estambre a mi lista de must knit, los colores se ven preciosos en tu chal. Gracias Martha! Los estambres de Evilla son maravillosos! Es posible encontrarlos en México? Yo los consigo aquí en Islandia. La página está en islandés. Para ver los estambres de Evilla pincha en la barra lateral izquierda donde dice Evilla/Randalína - litaskipt garn. Sjölin þín eru ótrúleg - alveg dásamleg listaverk! :-) Þú ættir að halda námskeið í því hvernig á að prjóna svona sjöl - ég myndi skrá mig strax! Það er í raunogveru alls ekki erfitt að prjóna svona sjöl! Judi: hahaha, good rule! Actually, the same day I blocked the shawl we got some friends coming over for a coffee and some of them pointed this out! One of them was so worried that I would forget some pins on the bed. 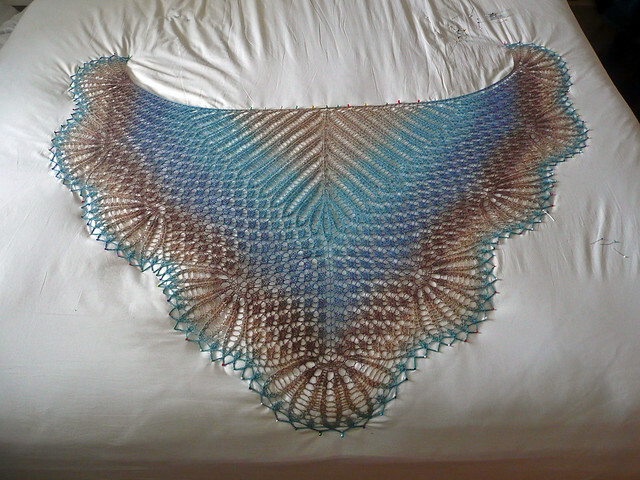 Until now: never happened and I have blocked quite a few shawls on my bed! About the colors, Evilla has wonderful color combinations! But yes... you have to check what ending you're going to use first because they are absolutely different. Kristín: Gerum það! Ég get algjörlega kennt þér að lesa töflurnar. Hvaða sjal ertu með í huga? Gaman! Eitthvað sem þú telur henta byrjanda í sjalaprjóni! 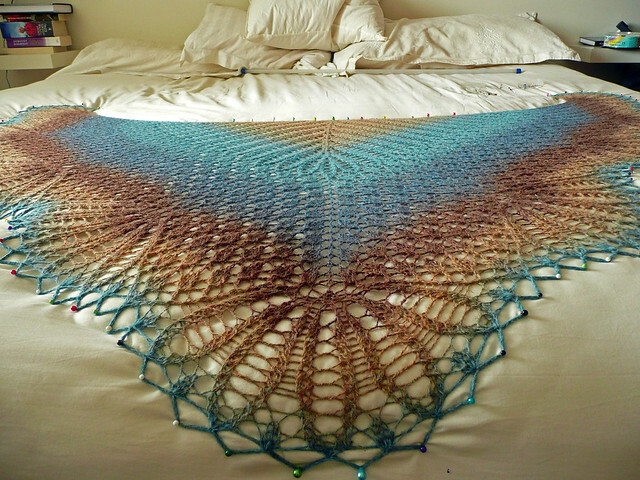 That's one of the most beautiful shawls I have ever seen! Me encanta!!!! Necesito tejerlo!!! Donde puedo comprar el patrón? Es verdad... hacía mucho que no sabía te ti. Muchas gracias por pasar por mi blog... me costó un poco decidirme a empezar este blog hasta que finalmente lo hice y la verdad es que me encanta mantenerlo! He conocido personas muy lindas a través de este medio.